Hmmm... the forecast does not look good for finishing up my Rosamund cardigan during the Olympics: I'm a little further than this now -- a few more rows before I divide for the sleeves. Rowanspun Aran knit up at this tight gauge, all bunched up on the circular needle, does not do wonders for my poor wrists. Oh well, I've been squeezing in some other projects that aren't as wrist-intensive. This pattern features really neat construction! With the double knitting technique you knit a little “pouch” that forms the body -- no DPNS and no seaming. I added a pom-pom instead of a felt tail. I hadn't made a pom-pom since I was 9! I finally broke out my Lion Brand pom-pom maker, and it's very slick and a little less fussy than the handmade cardboard cutouts from back in the day. Now who ever said that crafting wouldn't pay off in the end? Paul alerted me to this amazing quilt up for auction. 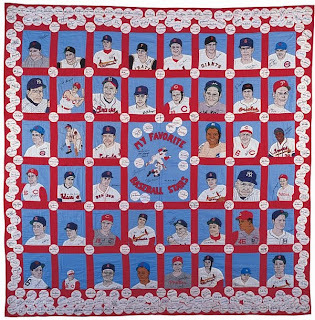 It's not often that baseball and quilting come together in such a fascinating way. This is a true treasure. The quilter, Clara Schmitt Rothmeier was truly a baseball enthusiast, as well as being a softball player herself. She collected all of these autographs and embroidered over them. Remember how much trouble Stephanie Pearl-McPhee encountered at the airport because her airline screwed up her hyphenated name? I don't know how many other people were incensed by this, but I certainly was. As a fellow hyphenated-namer, I have terrible troubles entering my legal name on travel websites (among others). With the new TSA requirements, your travel documents are supposed to match your government IDs exactly. When I booked a recent flight on Southwest, I encountered problem after problem entering my information into their forms: "special characters" and "unacceptable" information were cited as reasons. Yes, entering my legal name, as recognized by the U.S. government, as well as the states of Minnesota and Illinois, is impossible in their system. Thank you for your e-mail. Unfortunately, there are various programming issues in our reservations system that prevent us from allowing special characters (such as hyphens). Accordingly, we cannot accept hyphens or other special characters as part of the name on a Rapid Rewards account or when a Customer books a reservation. Please know that our Technology Department is aware of this limitation. As part of the new Transportation Security Administration's data requirements with Secure Flight, Customers' names must match their government-issued ID. Please know that Customers who have a hyphenated name may enter a space rather than a hyphen. It is also important to note that the name on your ticket must exactly match the name on your Rapid Rewards account in order to receive credit for your travel. If you need assistance obtaining past flight credits because the name you used in your reservation does not exactly match the way your name is listed in your Rapid Rewards account, please feel free to contact us at 1-800-I-FLY-SWA (1-800-435-9792). Jerks! Why don't they fix their system? Shouldn't the airlines have competent computer programmers? Is this a ploy to have a significant portion of their customers not earn their Rapid Rewards points? Or, more likely, is this a form of discrimination against women, especially professional and academic women? I've even received an impromptu lecture from an employee at the Illinois DMV on my name, as she argued that my hyphenated name showed that I wasn't fully committed to my marriage. She then proceeded to misspell my name on my driver's license, to boot. I fully recognize that it was my choice to hyphenate my name and that it's a bit long and unwieldy. That said, it's my legal name, and hyphens aren't some sort of crazy, newfangled punctuation, and hyphenated names are nothing new -- the Brits have been using them for centuries, albeit not necessarily for the same reasons. Stashbusting projects generally don't turn out so well for me. OK, the finished projects themselves may be lovely, but more often that not I run out of yarn and then am wracked with guilt as I try to figure out what to do. Plus I don't want to spend much money to acquire more yarn to finish, as the whole point of the exercise was to knit from my stash. In sum, stashbusting is stressful. One more case in point: Another giant granny square, this time using all my Noro leftovers and odd skeins, mostly Kureyon and Cashmere Island. As you may have guessed, I've already run out of yarn at just 30" square. What to do? Just crochet a big-a@% contrast border using nature's brown or oatmeal Fishermen's Wool? Buy more Noro? Anybody have any tips for a great source of discount Noro? Webs (which is where I usually get my closeout/discount Noro fix) doesn't have any right now. I had planned to knit a Tea Leaves cardigan, but I started having qualms about the overly wide neckline on the larger sizes. Only bummer about the games being in Vancouver is that there's nothing to watch in the morning! Old Man Winter sent us about a foot of snow on Tuesday. Paul worked from home, and we took made the most of it by going for a midday walk around our neighborhood and a quick jaunt to the Southport Grocery and Cafe for lunch (mmm... the grilled mushroom/spinach/brie sandwich is to die for). All this wintry weather has been perfect for curling up under my giant granny square afghan with a good book (currently The Children's Book, by A.S. Byatt). I'm still weaving in ends, but that hasn't stopped me from enjoying it. I would have liked to make it a little larger, but I ran out of yarn. 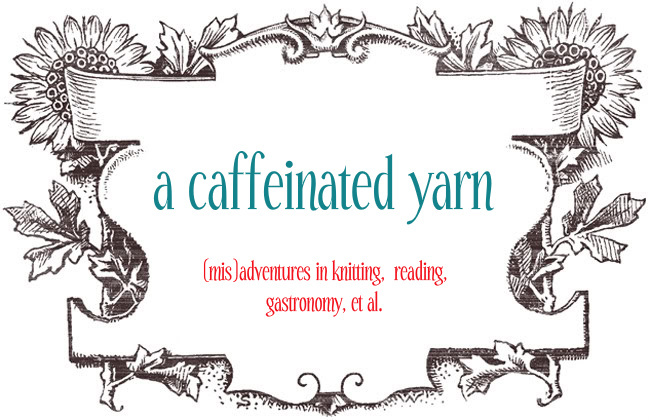 Man, this project truly was a yarn-eater. Hook: Clover Soft Touch "J"
Last weekend's trip to Madison with our friends for the Camp Randall Winter Classic outdoor hockey game was fabulous. One of the best weekends ever, plus the Badgers beat the Wolverines! Last weekend my knitting circle friends came over to my place for Crochet Fest 2010. A few of them graciously volunteered to teach us how to wield a crochet hook. It was quite fun, and I'm cranking along on a giant granny square, a la Fricknits, helloyarn and the Ravelry giant granny CAL group. I started off with this tutorial at craftstylish, then checked out this free pattern from Lion Brand. That is one big fuzzy tummy! We put her on a diet when we first adopted her (she was 7 or 8 at the time), and this is the slimmed-down version of Kylie. Yikes!